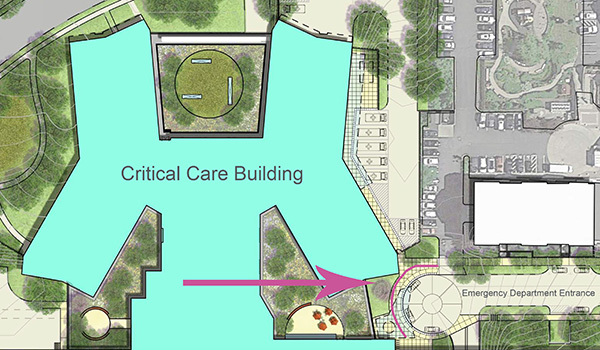 You can add to the beauty of the landscape of the Critical Care Building and leave a lasting mark on the Cincinnati Children's campus by purchasing an engraved paver. Your paver will commemorate your support while also helping to improve care for the sickest kids we serve. Make a one-time donation or pledge payments each month for 2 years with a credit card. Make pledge payments each paycheck for 2 years through payroll deduction. A member of our staff is happy to answer your questions. Please contact us at 513-636-5647 or paver@cchmc.org. Where will my paver be located? Pavers purchased at this time will be placed in front of the new Emergency Department. Please follow the pink arrow to the pink line below. The pavers will be located along the pink line.